I've been thinking so much about the concept of 'time' recently - and how it can be both our best friend, yet also our worst enemy. At the moment, all I'm thinking about is the time that I have left of seeing my friends all day, every day and of coming home and seeing my family in the evening. The time left I have to improve my grades (which, lets be honest, I need an eternity for that), to lie in the bed I've lay in most nights of my entire existence and to remain comfortable in my every day surroundings. Because, in just a few months time, that is all going to change - and to say I'm scared would be an understatement (I.AM.TERRIFIED). Something that has always bothered me is the fear of the unknown - to delve into something that I am unsure of, because I am used to being so certain of everything I do. I wish I could say that I'm one of those people who take risks, who find solitude in the infinite masses of uncertainty, but I am truly not. I crave adventure, yet I am also fearful of it - because everything always seems so much better in my head than it usually pans out. I have so many dreams, so many ambitions, so many things that I want to do - yet I feel like time is standing in my way, snatching all of these away from me. It's weird isn't it, how time can pass by either so quickly or so slowly. 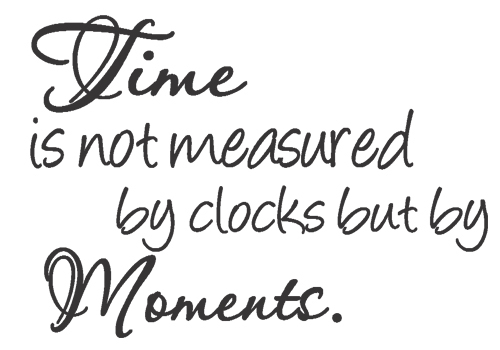 There's certain moments when you feel the time passing by - e.g. sat at a desk for what seems like forever, writing notes until your hands ache and your brain has reached it's maximum feed of information for the day. Yet, then there are times when time doesn't seem to exist at all. Times when you don't feel the minutes fly by, times when you look at the clock and wonder if you are reading it correctly - times when you are just existing in that moment without thinking about anything else at all. I hate going to sleep, mainly for the sheer thought that I don't understand the concept at all. It's weird, isn't it? How for 8 hours or so you're just not existing at all, your mind being occupied by strange scenarios which are exhibited in a manner which makes you truly believe that this is reality. That sigh of relief you do when you realise that everything that happened in that weird state of illusion is merely that, and you can proceed with the rest of your day whilst the memories of your dream flutter away. I have the strangest dreams, which often feel more real than everyday life. My dreams take me to places I am afraid for my mind to wander to, and there have been countless times when I've woken up in a state of shock and panic. Times when I've wondered how it can all just feel so real. Maybe in a parallel universe somewhere, we are existing elsewhere. 'Deja Vu' is a concept which completely messes with my mind, and if I think about it for too long I start questioning pretty much everything I have ever deemed as reality. How you can be in a completely new situation or setting, yet feel as though you've already experienced all of this before. However, this can sometimes act as a comfort blanket too - you are somehow enraptured in the notion that things are going to turn out okay, because you have already been through this before and here you are. 'Time is the greatest healer' is a phrase I used to hear repeatedly, and for so long I would pass it off as something people would say in order to make me feel better. Yet, over the past year and a bit I've learnt that this is the ultimate truth. I spent what felt like an eternity in the most intense feeling of pain I have ever felt in my entire life, and I believed that this is how I would feel for the rest of my life. I thought that every day I would wake up with the same dull ache inside my heart, and whilst I'm not going to sit here and pretend like that is completely non-existent - the pain has massively subsided. Sometimes all we need is a little time. I'm thinking back to times in my life when I've felt truly, completely and utterly happy - and, if I'm perfectly honest, that is right now. The other day I got a text from a lovely friend of mine asking how I was doing, and for the first time in what seems like forever, I replied with 'The best I've ever felt in a long time, I'm in such a good place right now' - and I truly meant that. Whilst people, like myself, were expecting this previous weekend to be difficult, sad, lonely and heart-wrenching, I can honestly say it was anything but that. Whilst there are still moments that take my breath away, or where I am overwhelmed by the sensation of grief, there are also moments where I am laughing until I have tears streaming down my face and where I feel that it isn't possible to be happier than I am in that moment. Time is a funny thing. It's confusing and sometimes bitter, yet it's also magical. I guess in this little ramble I'm trying to get the message across that whilst there are definitely moments when it seems 'time' is standing in the way of everything we dream of achieving, sometimes it really is our greatest friend. I guess we should cherish it, rather than attempting to battle it.